There comes a time in everyone's life when a romantic beach getaway is crucial. Whether from the stress of work, families or other circumstances, sometimes you just need to get away and re-connect. The east coast has some spectaular beaches and the most romantic bed and breakfasts. From Provincetown and Cape Cod Massachusetts all the way down to the Florida Keys you can find some of the best beach inns. Below you will find some of our favorite bed and breakfasts on the east cost. Crowne Pointe Historic Inn & Spa - Provincetown, MA – The Crowne Pointe Historic Inn & Spa of Provincetown is a classic 140 year old Cape Cod Sea Captain's estate. This unique Provincetown hotel is comprised of 40 rooms situated in six large fully restored historic buildings with a spacious main mansion, spa and fine dining restaurant. This landmark Provincetown hotel features spacious guestrooms and luxury suites wrapped around a beautifully landscaped courtyard and our award winning, full service, in-house Provincetown spa. The interior design compliments the spectacular Provincetown landscape of sand dune vistas, marsh grass, blue-green waters and sandy shoreline. Natural materials with fine craftsmanship abound throughout the hotel including hardwood floors, soothing wall colors and gently rotating ceiling fans. The Sunset Inn - Provincetown, MA – The Sunset Inn is one of Provincetown's oldest guesthouses. Built in the Mid-Nineteenth Century as a private home, it has been a guesthouse welcoming visitors to Provincetown for more than half a century. If the Sunset Inn looks familiar, it may be that you've seen one of the many paintings and photographs depicting the building. Scores of artists have been attracted by the stately elegance and beauty of the inn. Inn at Cook Street - Provincetown, MA – Celebrating 173 years, this Provincetown bed and breakfast is a lovingly maintained 1836 Greek Revival. The Inn at Cook Street features two cottages, two bedroom/living room suite combinations, and four bedroom suites all with private bath and some with fireplaces and sundecks. Many of our accommodations have private entrances and access from the secluded gardens as well as from the main house. Luxuriate in 800 thread count Egyptian sheets and towels. Enjoy a full breakfast with European and American coffees and an assortment of herbal teas. Relax in the afternoon at the nearby bay beach only steps away and then savor our afternoon baked goods, complimentary iced coffee or tea and spring water. Enzo Bed & Breakfast - Provincetown, MA – Enzo is located on the edge of the thriving west end of Provincetown, Mass., across the street from Cape Cod Bay. The property is one-quarter mile from the Provincetown Whale Watching Cruise and one-half mile from the Pilgrim Monument and Museum. Enzo is a fully-restored Victorian home named after the famous Enzo Ferrari, an icon of style, speed and Italian hospitality. Enzo includes an Italian restaurant and a Grotta Bar offering cocktails and entertainment. Carlisle House Inn - Nantucket, MA – The Carlisle House Inn, a recognized star-quality Nantucket bed and breakfast inn, welcomes you year-round. Experience the uniqueness of each season on Nantucket Island. Enjoy Nantucket from our convenient location in the Old Historic District, just a few minutes’ walk to the ferries, The Whaling Museum, Main Street shops, galleries and fine dining. Brant Point Lighthouse and in-town beaches are also just a short walk or bike ride away. Start your day with our sumptuous breakfast featuring home-baked specialties; relax and mingle at our popular weekly wine and cheese parties. Woods Hole Inn - Woods Hole, MA – Perched on the edge of the Harbor and steps from the Martha's Vineyard ferry, the Woods Hole Inn is the perfect place to start your Cape Cod vacation. 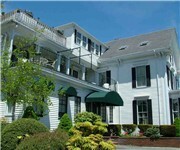 The Woods Hole Inn is a modern classic, born in 1878 and made modern in 2008. From here, watch the ferries coming and going across Vineyard Sound, enjoy sunset from the deck, have a lobster roll at our restaurant or stroll to one of several world-class beaches. Woods Hole is packed with shops, waterfront restaurants and fun things to do. It's a great location for easy day trips to Martha's Vineyard, or a place to rest on the long journey there. Woods Hole has an aquarium, charter boats, an 11-mile bike path that starts at our door plus excellent walks, birding and fishing. 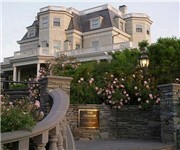 The Chanler at Cliff Walk - Newport, RI – An historic, luxury, European styled boutique hotel, the Chanler at Cliff Walk boasts the best ocean view in Newport. Only steps from the beach and a mile from downtown, it is the first mansion and only hotel located on the famous Cliff Walk. Recently ranked #1 Recommended Hotel in Newport by TripAdvisor.com, come experience the difference at The Chanler at Cliff Walk. The Chanler has twenty exquisit guest rooms, each with its own historically inspired details as well as the romantic and award-winning Spiced Pear dining room offering the discerning traveler a glimpse of Newport’s Golden Age. The Chanler is a truly special part of the history of Newport and one of the most unique luxury hotels in the area. Voted one of the 15 best new luxury hotels in the world (Food & Wine 2003), The Chanler is a perfect destination for romantic getaways, corporate retreats and intimate weddings & celebrations. Barclay Cottage - Virginia Beach, VA – Stay at the Barclay Cottage, a Virginia Beach bed and breakfast, and step back to a time when things moved more slowly and life was less hectic. At Barclay Cottage B&B, we anticipate your needs. Built in 1895, and nestled in an historic neighborhood, this award-winning B&B is just a few minutes' walk to the broad Virginia Beach boardwalk and world’s longest beach. While close to all of the exciting things that the area has to offer, you’ll appreciate returning to this peaceful and romantic alternative to high-rise Virginia Beach motel and hotel accommodations. Bayfront Marin House B&B - St Augustine, FL – The Westcott House Bed and Breakfast, built in 1880, will take you back in time to the Victorian Age. It is one of the few inns located directly on the magnificent Matanzas Bay and within walking distance of historic St Augustine . Each guest room is romantically decorated with period antiques, some with double Jacuzzis and fireplaces. Voted "# 1" in St. Augustine by St. Augustine and Jacksonville Residents. Featured in numerous magazines and publications referring to the Westcott House's superior decor and service. La Mer Hotel & Dewey House - Key West, FL – La Mer Hotel & Dewey House, Key West’s award-winning oceanfront boutique hotels, complement our collection of dynamic hotels in historic old town. Each of these intimate luxury hotels has a unique, turn-of-the-century feel, spacious rooms and are connected by lush tropical gardens, towering palms and brightly colored flowers. 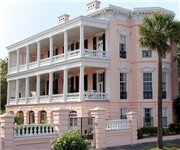 Their sense of class and historic charm make them some of the most unique accommodations on the island. Southernmost Hotel, Southernmost on the Beach and La Mer Hotel & Dewey House have all received the prestigious "One Palm Designation" by the Green Lodging Association of Florida. From the shores of Washington state to the California coast and Hawaii, the west coast has some spectacular beaches and bed and breakfasts on the beach. Some of our favorite bed and breakfasts on the west coast are below. West Cliff Inn B&B - Santa Cruz, CA – This distinctive Santa Cruz, California bed and breakfast inn is situated on a bluff across from Cowell's Beach and the famous Santa Cruz Beach and Boardwalk. 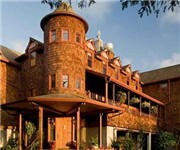 West Cliff Inn is the newest hotel in the Four Sisters Inn's collection. The stately, three-story Italianate Victorian with its spacious, wraparound porch was completely renovated and features a breezy, coastal décor with fabrics in crisp blues and whites. This Four Sisters Inn blends the modern luxuries and sophisticated services of a boutique hotel with the traditional amenities and architecture of a B & B.
Ka'Awa Loa Plantation Guesthouse and Retreat - Captain Cook, HI – Bed and Breakfast guest house for your vacation on the Big Island, located at the Kona Coffee Belt, Kona Coast, Big Island, Hawaii. Ka’awa Loa Plantation is a Guesthouse and start-up coffee farm located in the heart of the Kona Coffee Belt on the island of Hawai’i. The 5-acre estate is nestled in tropical surroundings at the elevation of 1,200 feet directly above Kealakekua Bay. Our venue offers a wonderful spot to base your Big Island adventures. Nestled amid tropical surroundings on a five-acre estate in the Kona Coffee Belt, the plantation produces organic crops, including Kona coffee, bananas, mangos, papayas, coconuts, passion fruit, dragon fruit and white pineapple.